Gov. Doug Ducey will face a test of his leadership from Democrat David Garcia, who came out on top of the three-way Democratic primary last month. Ducey has built his re-election campaign around the theme of security, both in terms of border security and economic security. Ducey has done his best to tamp down potential trouble, particularly with voters concerned with education. For example, after months of saying that the state could not afford to give teachers more than a 1 percent raise, he reversed course during the legislative session and agreed to push for a 10 percent pay increase in this year's budget and a 20 percent increase by the year 2020. In Garcia, Democrats believe they have found someone who can take the education fight to Ducey. A military veteran and a professor at Arizona State University who has worked as a top administrator in the Arizona Department of Education, Garcia previously ran for State Superintendent of Public Instruction in 2014 and has made education a cornerstone of his campaign. Two polls in the last week paint different pictures of the race. 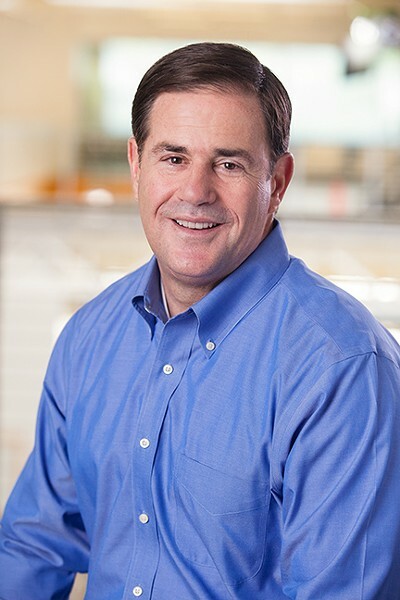 One, from Democrat-leaning Public Policy Polling, shows a tight race, with 44 percent of voters preferring Ducey, 43 percent supporting Garcia and 13 percent of voters undecided. But a second survey, from Data Orbital, shows Ducey with a solid lead, with the support of 48.8 percent of those surveyed, compared to just 41 percent for Garcia. Just 7.9 percent of those surveyed were undecided. • The race for Arizona Attorney General will pit incumbent Republican Mark Brnovich against January Contreras, a lawyer who served as a top aide to former Arizona governor Janet Napolitano. Brnovich worked as a local, state and federal prosecutor as well as an attorney for the Goldwater Institute and the Corrections Corporation of America before unseating Republican AG Tom Horne in the 2014 primary. Before getting into the race for Attorney General, Contreras worked as a state and county prosecutor, served as a policy advisor to former Governor Janet Napolitano in Arizona, and continued working with Napolitano in Washington after the governor became Secretary of Homeland Security. Contreras said she got into the race because she was concerned by Brnovich's political bent, such as suing over the constitutionality of the Affordable Care Act or trying to prevent DACA recipients from obtaining Arizona driver licenses. "I've been around long enough to know what good governments look like and what I see right now is that the eighth-grade lessons of checks and balances that we learned so long ago, it just doesn't exist right now in Arizona," she said. • In the Arizona Secretary of State race, Republican Steve Gaynor, a political newcomer who defeated incumbent Secretary of State Michele Reagan in the GOP primary, will face Democrat Katie Hobbs, a state lawmaker. • Republican Frank Riggs, a former California congressman who ran unsuccessfully for Arizona governor in 2014, managed to unseat Superintendent of Public Instruction Diane Douglas. Riggs will face schoolteacher Kathy Hoffman in a race to determine who will head up the Arizona Department of Education. • Republican Kimberly Yee will face Democrat Mark Manoil in the race for Arizona Treasurer. • In the GOP race for two seats on the Arizona Corporation Commission race, Tom Forese was knocked out of office by primary voters. Incumbent Justin Olson and one-time Democrat Rodney Glassman will be the GOP's standard bearers in November. Making up the Democratic slate are former ACC member Sandra Kennedy and Kiana Sears, who has worked as a water policy consultant for the ACC. The GOP-led Corporation Commission has been rocked by scandal in recent years and members remain engaged in internal strife over whether to investigate campaign spending by Arizona's largest utility, APS, which has been pushing commissioners to reduce subsidies for rooftop solar systems.